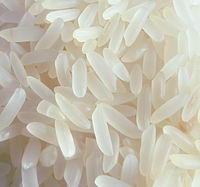 Question 1: Japanese ________ rice is another kind as well. Question 2: Rice is the seed of a monocot plant ________. Question 3: This causes nutrients from the outer husk, especially ________, to move into the grain itself. Question 4: Rice flour and ________ often are used in batters and breadings to increase crispiness. Question 5: 1500-800 BC) and then is frequently referred to in ________ texts. Question 6: Although, the diffusion of rice in much sub-Saharan Africa remains uncertain, Arabs brought it to the region stretching from ________ to the White Nile. Question 7: White rice may also be buffed with glucose or talc powder (often called polished rice, though this term may also refer to white rice in general), parboiled, or processed into ________. Question 8: In 1694, rice arrived in South Carolina, probably originating from ________. Question 9: Cooked rice can contain ________ spores, which produce an emetic toxin when left at 4°C–60°C . Question 10: In ________ there is a saying that grains of rice should be like two brothers, close but not stuck together.